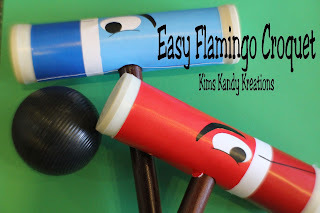 When I was trying to throw my Alice in Wonderland party a few years back, I had the hardest time trying to find Flamingo Croquet. After all, you can't have an Alice in Wonderland party without the famous croquet game! After searching high and low, I didn't have any luck, so I decided to make my own Flamingo Croquet. I used PVC pipe and it was a bit complicated and difficult, but do-able. I shared the directions HERE. But after a few years, I got to thinking that maybe there was a better, easier way to make this. One that didn't involve drilling, cutting, and unhelpful blobs of glue. Then, an idea came to make my printables fit an already made croquet set from Amazon. DUH! I guess I couldn't find an appropriate set to work with all those years ago. Or maybe, like Dear Hubby says, I just like to be complicated. I found this Halex Select 6-Player Croquet Set in Deluxe Carry Case from Amazon. It was about $35.00. I like that it comes in a zip case that allows you to store everything inside it and keep it all together and safe. After the mallets I made from my other Alice in Wonderland Croquet set ending up all over the house and torn up, I like that this can be all secured away. Then I took my Flamingo head printables, printed them out, cut them up, and glued them on. So easy! And the Guardsmen Wicket pieces were just as easy. I made two different instructions so if you want to make yours super sturdy and durable, or if you are just wanting something quick and easy. Either way, I've got you covered! I'm super excited about how much easier it will be now for you to enjoy Flamingo Croquet at your next Alice in Wonderland party. You can find the printable in our shop HERE or if you still like the old fashioned DIY set made from PVC pipe, you can still find the directions and printable HERE.